After 1 month of uploads, thousands of votes and a little controversy in the design community- we now have 10 great finalists that you can choose from that will be printed and sold in the Dj TechTools web store. 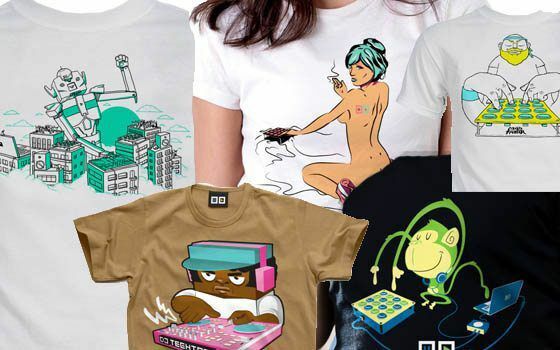 The 5 shirts above are just a few of the creative designs submitted by fans, designers, djs and regular folks like you that make up this great online community. Show your support, head over to the forum, and place your vote now! Why Finals? I thought this was a one round thing? It was, but our initial system of multiple votes and email based verification turned out to be a major fail. Round one was a good indicator of the top 10 designs but there were a lot of very questionable votes and ballot stuffing. To keep things fair, voting has now been moved over to the Dj TechTools forum to keep things more fair. Additionally, the top 2 designs in the contest did not make it to the finals due to dozens of fake emails that were used to vote for those designs. Some great Dj TT stickers.